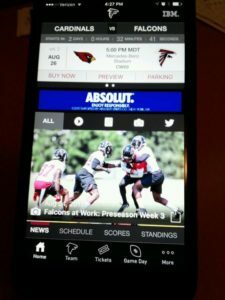 It might have taken some recent all-nighters, but the crew behind the technology at Mercedes-Benz Stadium said that the Wi-Fi and DAS networks, as well as the new app, will be ready to go when the Atlanta Falcons hold their first big event at their new home this Saturday. The first potential for a packed stadium comes Saturday night, when the Falcons host the Arizona Cardinals in an NFL preseason game. 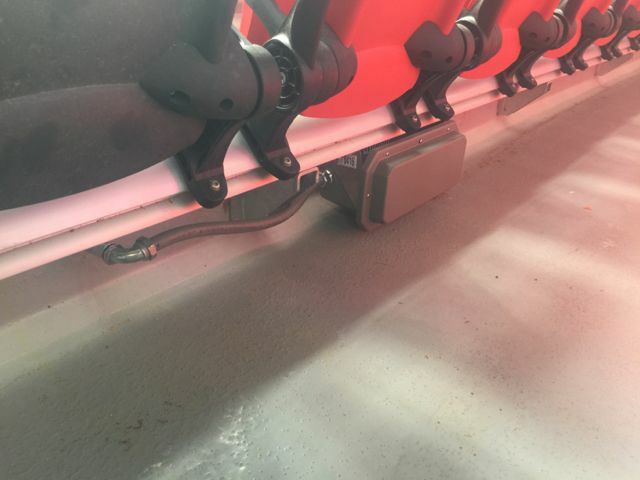 With roughly 1,800 Aruba Wi-Fi APs installed inside (1,000 in the seating bowl and the rest in concourses and other areas), Mercedes-Benz Stadium should have excellent Wi-Fi coverage, even if it takes several events to figure out the things you can only figure out once you have live people in the seats. “We’ll need a few events until we get to a spot where we’re dialed in [with network performance],” said Miller. 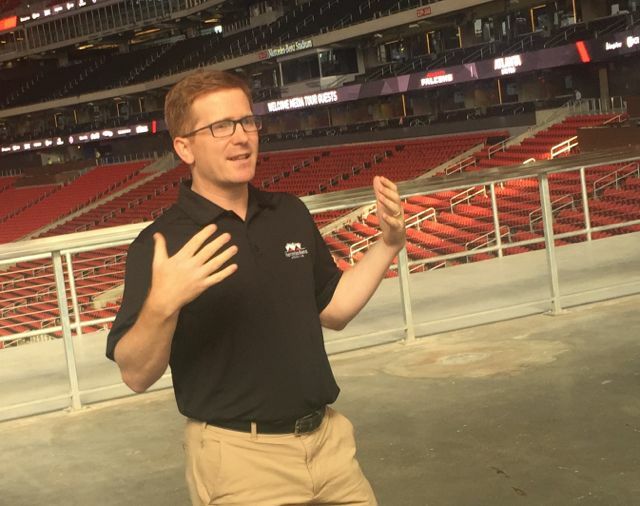 Though Miller said the Falcons were able to get some network feedback during a recent season-ticket holder open house, real performance stats won’t come until fans are filling the venue for an NFL game. “You just have to go through a series of events to see actual performance,” Miller said. One area that might cause some delays getting into the arena is the Falcons’ decision to go to all-digital ticketing — fans must either have an RFID card (for season tickets) or must download the new team app so they can have digital tickets on their phones. Both the RFID cards and phones can be scanned at the SkiData turnstyle machines. “We’re encouraging fans to download the app before they get to the game,” Miller said. 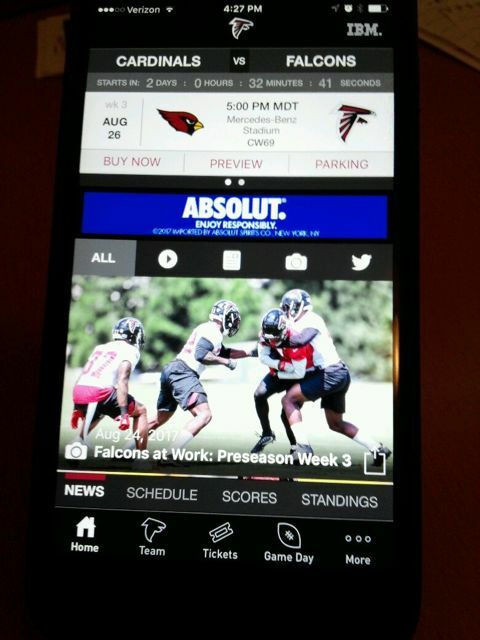 The new version of the team app, which was only made live in the last couple days, was built by main IT contractor IBM. 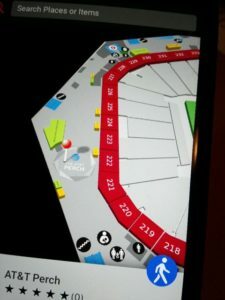 The IBM app will do things a little bit differently than other stadium apps; the wayfinding maps are not “blue dot” or interactive like Google Maps or other stadium apps like those at Levi’s Stadium or Sacramento’s Golden 1 Center. Instead, fans must enter both their location and their desired destination to see a path on a stored map. Food ordering via the app is also handled differently than apps that support in-seat delivery or express window pickup. 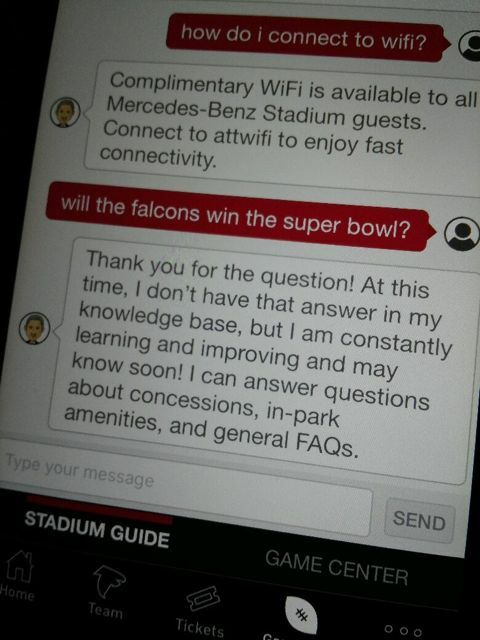 With the Falcons app fans will select from a list of concession stands, then enter credit card information and their order, which will be scanned at the stand, according to IBM. While such new services always take some time for fans to discover and use, Miller is keen to see if the new systems work as promised. 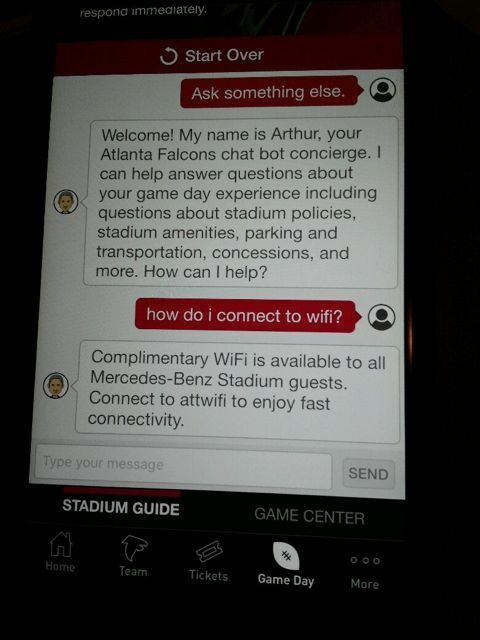 The app also has a Falcons-esque chat bot, called “Ask Arthur” for owner Arthur Blank; while the bot can quickly answer FAQ-type questions about the stadium and its operations, more open-ended queries will require perhaps some time with IBM’s Watson technology (see examples in photos below). 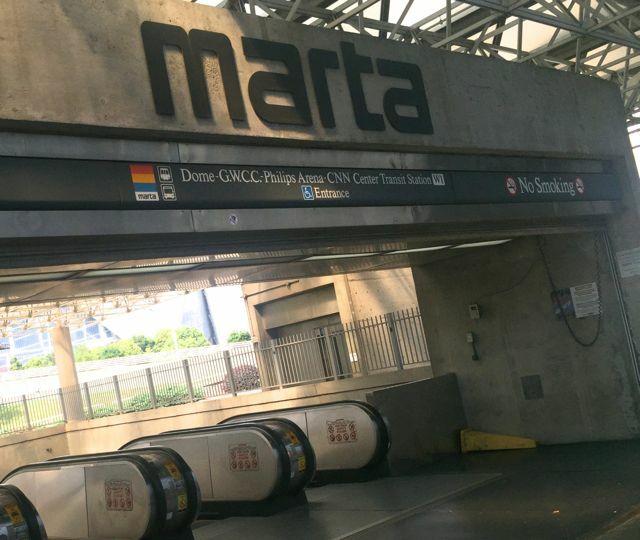 And on a final low-tech note, Miller said the Falcons had been in constant touch with several local groups, including the Georgia Department of Transportation, the city of Atlanta and the MARTA light rail system to get all the pertinent maps and signs updated. 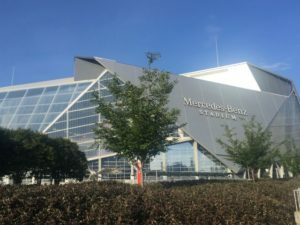 On Mobile Sports Report’s visit to Mercedes-Benz Stadium and Atlanta last week, we noticed that there were very few signs up with Mercedes-Benz Stadium on them. 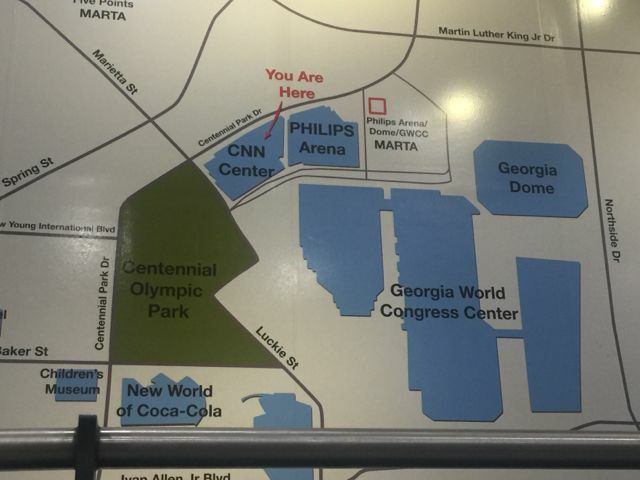 One big map on the wall inside the nearby CNN Center (where there is a large public food court) didn’t even have Mercedes-Benz Stadium on an area map, and a sign over the MARTA station just outside the new stadium’s doors had no mention of Mercedes-Benz Stadium but still did mention the Georgia Dome, the next-door neighbor slated for demolition. The MARTA online map still lists “Dome” but not “Mercedes-Benz Stadium” for the stop outside the venue’s doors.